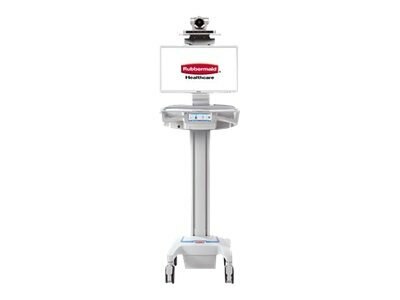 This Telepresence cart is equipped to enable video communication to enhance your workflow with real-time consultations. Enjoy this best-in-class mobile workstation with a 7" glass touchscreen used for cart management. This cart will accommodate most video conferencing end point technologies. Enjoy this best-in-class mobile workstation with a 7”glass touchscreen used for cart management including personal preferences. With N-Stride steer assist, CareLink is virtually effortless to maneuver and control. Utilize this intelligent platform with remote fleet management with no software to install or maintain. This cart will accommodate most video conferencing end point technologies. Experience the electric lift with 15” range of motion. AC Powered Cart with 40 AMP Lithium Battery (300W). Brackets for video conferencing PTZ camera and microphone. 7” glass touchscreen for ease-of-use and individual preference setting. Intelligent Platform with remote fleet management and onboard calculator. Battery display indicates time remaining with visual queues. Onboard messaging software for sending communications. Electronic lift with 15” range of motion. Height adjustable rotating monitor bracket. Base size: 19” d x 17” w, contoured to 15½” wide at center. Primary work surface size is: 21” w x 16” d.
Secondary slide-out work surface is: 11½” w x 10” d.
Casters: 5” precision bearing casters/2 locking. High touch surfaces made with antimicrobial materials. Intelligent cable management eliminates dangling cords. 2½ ft hospital grade spiral cord extends to 8 ft.
UL 60601 certified and listed for patient point of contact. This cart is intended to enable video communication and not intended for connection to electronic medical devices. Display/Monitor, camera, and other video conferencing accessories are not included with the cart.